SCVNGR first tackled FourSquare’s dominance of the virtual check-in space by acknowledging the fact that FourSquare is really a game. They addressed this by adding more gaming components to the model, such as, creating challenges or tasks to complete before receiving rewards of discounts or coupons from retailers. FourSquare responded by revamping its user interface with more ‘leveling up’ type features, plus adapting it as a ‘nearest retailer’ finder. 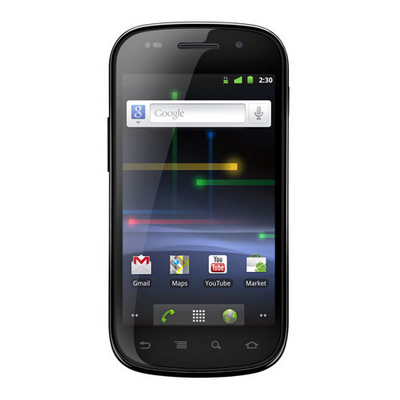 It then added a ground breaking “spend $5, save $5“ promotion, launching its first trial mid March 2011. Why ground breaking? It is the first mobile check-in system offering the ability to simply check-in to a retailer’s location and receive a discount by paying with a specific credit card – in this case, American Express (AmEx). AmEx debit the amount saved straight back to a user’s account, sending an alert at point of purchase. This is made possible by an innovation developed by AmEx called the ‘Smart Offer’ API – allowing for developers to build ‘digital coupons’ on top of the AmEx product. SCVNGR have come back fighting with a Groupon angle, offering a similar process of coupon-less discounts – but using it for pre-purchased offers. SCVNGR recognised potential weaknesses in the Groupon model, both from a consumer’s view of limited deal times and a retailer’s view of their commission structure. SCVNGR tackled both of these issues through offering an extended deal time allowing more offers available at any one time. And for the retailer they have a cheaper, performance driven, commission structure. 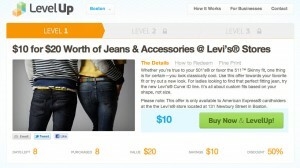 The retailer now benefits with SCVNGR not being rewarded until a customer ‘Levels Up’ and becomes a returning customer. Groupon takes 50% from each transaction, whereas SCVNGR is receiving nothing on the first, but then only 25% on subsequent transactions. Both FourSquare and SCVNGR have recognized the opportunity of innovation through combining game mechanics with a real digital coupon enabled by AmEx and its Smart Offer API platform. For sometime it’s been thought that, many current loyalty systems have become outdated and boring for consumers and, subsequently, have lost any sense of ‘fun’. One idea, in an attempt to keep the consumer’s attention longer, is to try some of the concepts that keep gamers addicted. 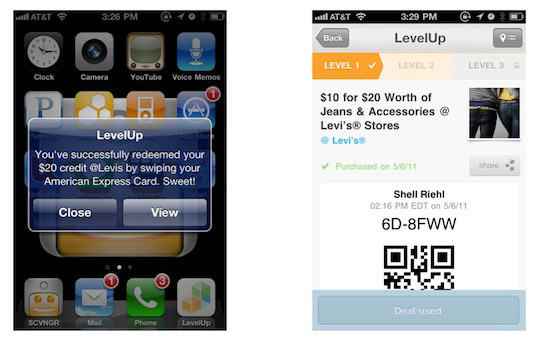 By comparison, and in the case of LevelUp, the more you use the discount (3 times), you get leveled up and receive a better offer. Of course these techniques are not new, they are repackaged to connect with current consumer interests and meant to be more fun. Interestingly, combining this with the AmEx Smart Offer system, makes the process of engagement almost ‘frictionless’, meaning that, once you have connected your AmEx card to Level Up, you don’t have to do much else. No need to print or tell anything to the cashier. No friction. SCVNGR tackled pre-purchase, whereas FourSquare is tackling the other consumer gripe of ‘I’m here and now what’ scenario. Combine both of these techniques together and you have the future of loyalty in motion. I personally prefer one loyalty system per brand, one card, one app. Its easy to track and easy to get your head around, compared to many credit cards ‘I do everything’ type of loyalty system. A thousand shops and a different promotion for each. It sounds like it makes sense, but in my opinion, people just become confused. We are seeing apps tackle this confusion, one per bank or credit card to tell you where you can use these promotions, but could you really be bothered? It breaks away from the whole point of brand engagement. One app per brand allows a brand to really engage fully and produce promotions that suit the consumer, which really leads me to my next point. I don’t see the trend continuing with FourSquare or SCVNGR for bigger brands, I think their customers are the smaller shops, but for the likes of Starbuck’s and large retail stores who will build their own more engaging applications. It is difficult to deliver a comprehensive brand experience without a dedicated solution, although I’m sure companies will develop a lower cost ‘white label’ solution for retailers with less budget. The real technology enabler here is simply connecting the credit card system to different types of mobile interaction, something that already works in other areas, for example, auto top-up systems and NFC (Near Field Communicaton) travel cards. Used for many countries travel networks, when your balance drops to zero it is automatically topped up from your credit card. No more hassle and consumer bliss. The innovation is building a platform around that process and add an API for third party developers to build new and interesting applications and solutions. More companies need to follow suit, developing communities around their existing products, producing new revenue and leveraging other creative minds and business acumen. A second revelation, is that AmEx is apparently giving third parties access to consumer information, including transactional data. Something unheard of in the past, this could finally set a trend of transparency with credit card companies having to work much closer with both brands and suppliers. With Apple and Facebook potentially driving new models of payment, including virtual currencies, it only makes sense for credit card companies to try and innovate new digital payment platforms before someone else does it for them. AmEx have clearly done that here and produced a system that allows developers to build great commerce experiences, the timing being perfect with the suspected launch of an Apple iPhone that includes NFC capability. Something Google has already announced it is working on with its partnership with Mastercard and CitiBank [ Link ], while Samsung and Blackberry have also announced future releases, including participation of Telco’s Orange and T-Mobile also getting in on the act with a partnership with Barclaycard [ Link ], although the Telco’s are more focused on their SIM cards and ‘Mobile Wallets’. Actually the concept of the mobile wallet is really something driving the whole NFC adoption, the timing is right. Consumers have acknowledged their interest in both mobile commerce and interaction in new loyalty methods. There is enough proof that that the idea won’t just fall flat on its face. There is probably still sufficient time for so called digital coupons to flourish and by the time NFC mobile payments are actually a reality, the consumer will be open to the idea of a mobile wallet anyway. It will make it much easier to see the benefit. My feeling, though, is that while all this takes place, it will still take some time to see these newer loyalty methods take shape. Marketers and brand owners in general have been much slower in the uptake of consumer driven social media. It takes time for people to adapt their knowledge and the tech industry will need to produce various platforms to enable the brands and their marketers to truly engage with their brand loyalists. FourSquare and SCVNGR are an example of the beginning of these new mobile marketing platforms. But we have a long way to go in integrating all the other marketing tools in to this idealist framework. CRM, feedback, competitions, promotions, analytics, the list is a long one. That said, NFC mobile payment could definitely trigger the next big disruptive change in marketing focus, while social media has been extremely challenging to the practitioners of traditional advertising. Mobile adds yet another layer of complexity to this already fragmented industry. Certainly digital coupons could prove to be a precursor to that trigger. Brands that experiment now will set themselves up to hit the ground running when it eventually does kicks in with force.